Using the simple materials in this kit, students can build a speaker that can be used with a radio, CD player, or tape player. Using the simple materials in this kit, students can build a speaker that can actually be used with a radio or CD/tape player. The suggested classroom activities and accompanying worksheets help illustrate the principles behind the operation of conventional loudspeakers - that of converting electrical signals into motion and then sound. Other principles which can be introduced and demonstrated as a result of these activities include electromagnetism, mechanical amplification of sound, and the interaction of magnetic fields, while employing Framework Science Standards PS3 and PS4. This kit has been aligned with all published National Standards. Pre- and Post-laboratory assessments and vocabulary words all target specific Science and Engineering Practices and common core standards. The teacher guide also contains specific “Did You Know” concepts that link the real world with the scientific standards explored. A student copymaster is also included. This kit includes enough materials to create 5 loudspeakers. Audio source(s), such as a transistor radio (s), portable CD/tape player(s), stereo(s), etc. This activity can be completed in one 45 minute class period. 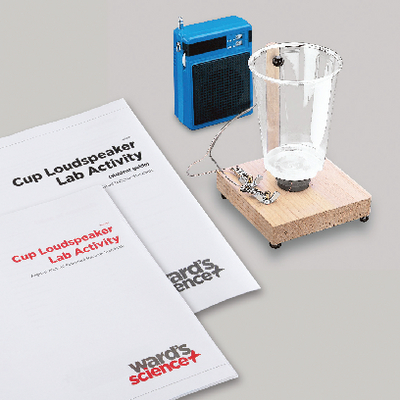 The suggested classroom activities and accompanying worksheets help illustrate the principles behind the operation of conventional loudspeakers: converting electrical signals into motion and then sound. Mechanical amplification of sound and the interaction of magnetic fields are some of the other principles that teachers can introduce and demonstrate with these activities. This kit aligns with all published National Standards. Pre and post-laboratory assessments and vocabulary words target specific science and engineering practices and Common Core standards. The teacher guide also contains specific “Did You Know” concepts that link the real world with the scientific standards explored. This kit includes enough material to create five loudspeakers. This activity can be completed in one 45-minute class period. Ordering information: This kit includes 5 drilled wooden bases, 5 wooden dowels, 1 roll of 32 gauge insulated copper magnet wire, 15 ceramic ring magnets, 10 bolts with nuts, 10 wooden screws, 5 washers, 10 alligator clips, 5 phone plugs with leads, 25 bumper tacks, and 1 length of solder. A teacher's guide and a student guide are also included.